This newly built pretty hotel is very quietly situated at the end of a cul de sac in the middle of the village of Paleochora, on the delightful south coast of Crete. The hotel is a mere 100 metres away from the beautiful sandy beach of Pahia Ammos and has 13 modern comfortable rooms attractively furnished in wood. At the entrance there is a large reception area with a sitting area, a TV and a bar. The bright breakfast room is delightfully located in a Conservatory with wooden beamed ceiling. The rooms are suitable for either 2 or 3 people, each having twin beds (some of which have an extra bed), a telephone, radio, shower/wc and a balcony with mountain views. Air conditioning, a safety deposit box, and a mini bar are available in the rooms, at an extra charge. 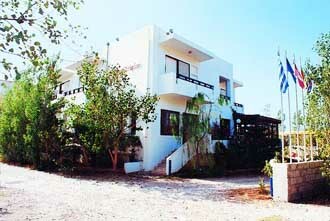 A large variety of shops and tavernas are nearby, and the hotel has a good sized parking area lined with trees. This small pristine well-maintained hotel is ideal for guests who are looking for a pleasant homely atmosphere and a central location.